Once a great city, now just empty holes. An audio recording of this step is available here or at the bottom of the page. Apamea is an ancient city located on the banks of Syria’s Orontes River at a ‘crossroad’ of various trade routes in the region. It greatly increased in size around 300 BC after the division of Alexander the Great’s Macedonian Empire and the rise of the Seleucid kings. 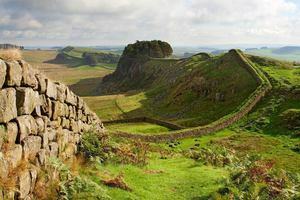 It later became part of the Roman world and is known for its impressive architecture: a “Great Colonnade” that ran for almost 2km; a monumental theatre that had a seating capacity of over 20,000 people. 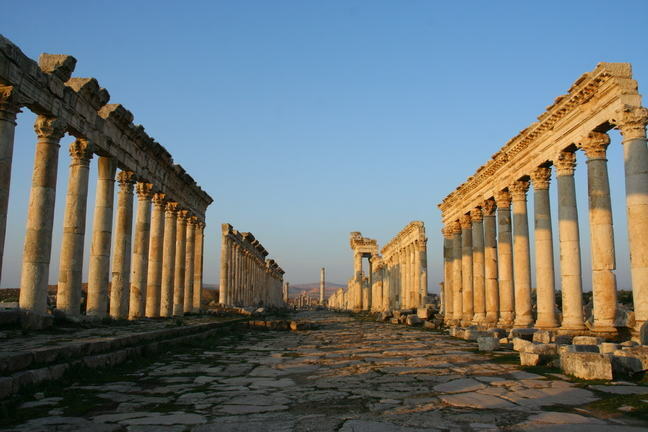 The population of Apamea in AD 6 was at least 130,000 but was maybe as high as 500,000. Clearly this was a large, cosmopolitan metropolis. The modern town located near what was once Apamea is now called Qalaat al-Madiq. Originally just an inhabited medieval citadel on a hill, Qalaat al-Madiq has expanded down the hill towards the ruins. By 2011, Qalaat al-Madiq and ancient Apamea were caught in the crossfire of the Syrian Civil War. Although the Syrian government continued to control the high citadel, rebels took lower portions of the town. In March of 2012, the Syrian Army shelled the rebels in Qalaat al-Madiq for over two weeks, in advance of trying to re-take the lower town. During a subsequent Syrian Army advance, a number of soldiers and civilians were killed. 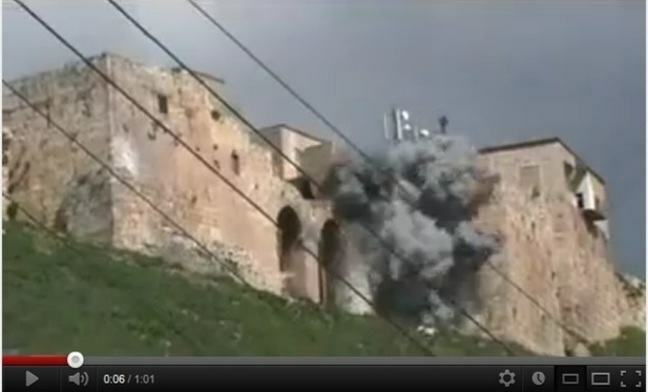 Still from a video of the shelling of the Qalaat al-Madiq citadel uploaded to Youtube by a resident. Due to the upset in control over the site of Apamea, all forms of archaeological site protection fell apart. The war-torn population of Qalaat al-Madiq and the surrounding communities, faced with few if any positive economic choices, turned to antiquities looting in the social and economic breakdown of the conflict. The results were devastating. In a very short amount of time Apamea was gutted and pockmarked. 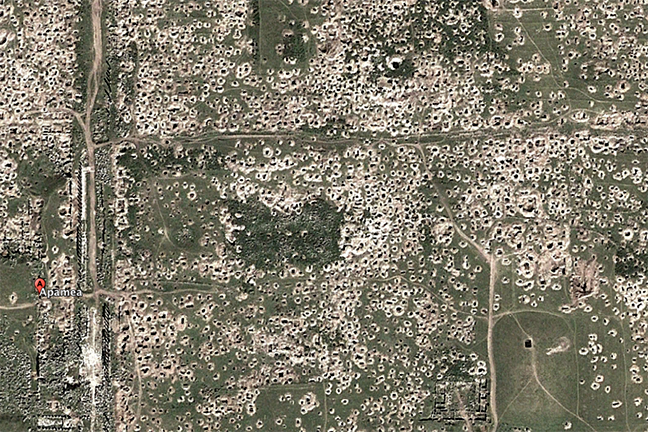 What was once a thriving ancient city is now a lunar landscape of looters’ holes. The destruction is devastating and we will never know what we have lost, but it is hard to blame the desperate people of Qalaat al-Madiq for their actions. People do what they must to survive. When a major looting event like Apamea happens, one of the first things that researchers and investigators do is try to quantify the loss: to put a number to it. In many cases, that could literally mean counting the holes to make a very rough estimate of how much of the site has been damaged and how many artefacts have been removed. Yet the very conflict and instability that facilitated the looting in the first place may prevent us from conducting fieldwork. Thankfully, technology is helping us avoid the danger and work remotely. 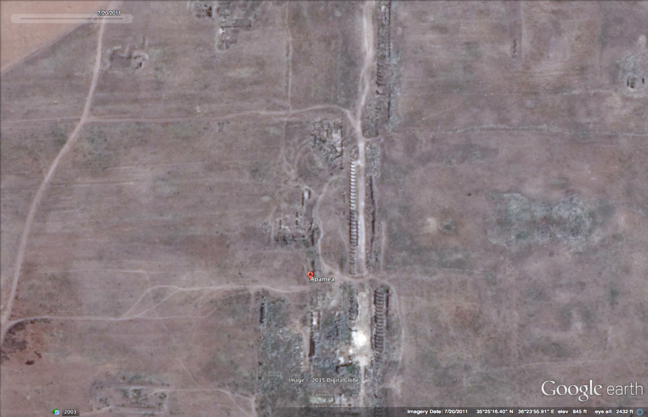 Now, when we want to quantify looting at a place like Apamea, we can start by counting the looters’ holes in satellite images using such tools as Google Earth. We can then use those numbers as a starting point for research and confirm them during fieldwork at a later, safer date. In this activity you are simply asked to count the holes. In reality this is probably an impossible task, but hopefully it will help you understand the massive scale of the loss of history to antiquities looting. If you lose count or tire of counting, focus on the reflection. 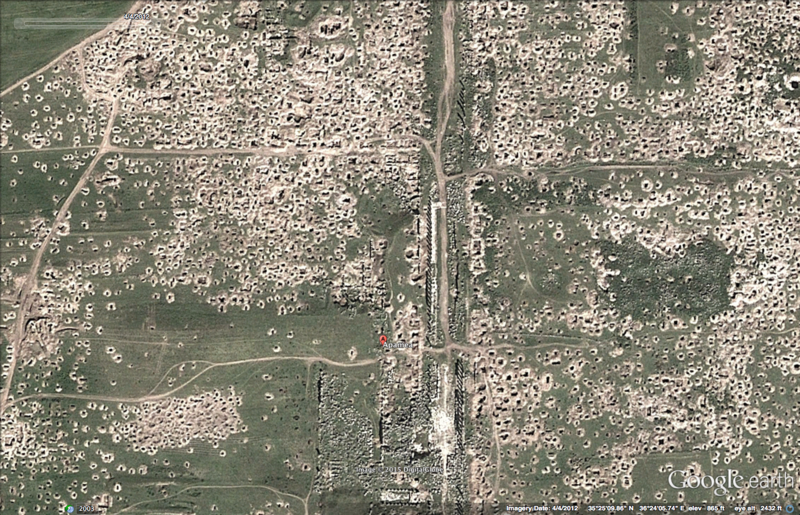 Below are images taken from Google Earth of Apamea before the conflict and then only a few months later after significant looting has occurred. It is the same place: note that you can see the Grand Colonnade running down the centre. The difference is startling and even upsetting. There are a lot of holes to count. It is tedious work, but it is the sort of thing that must be done. This sort of research is never easy. As you count, spend some time reflecting on what you have learned this week. Each one of those holes represents a trafficking case. Think about the loss to the archaeological record: does each hole represent a house? A tomb? What could have been found inside? What sort of information will we never, ever be able to recover? Think about how how the objects stolen from Apamea may be smuggled out of Syria and on to the market. Perhaps look at a map and imagine possible smuggling routes. What kind of people are able to move these pieces across Syria’s borders? Do you think they engage in other types of crime? 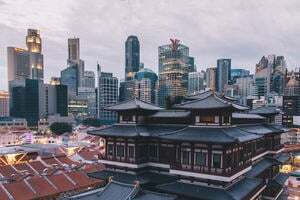 What might possible transit ports be? Ask yourself why people buy Syrian antiquities during times of unrest. Is it possible for them to tell if the artefact is looted? Is it possible for them to tell if the artefact is from Apamea? Why are people willing to participate in what may be a very dirty antiquities sale? Did you come up with a number of holes? Some thoughts? If so, post in the comments. Who loses when Apamea is looted, and who gains?